Holiday club children at Bright Kids Crabbs Cross enjoyed taking part in a variety of activities over Easter including Easter egg hunts, bonnet competitions, egg painting and making Easter cards, colouring competitions and group games aimed at developing confidence skills. 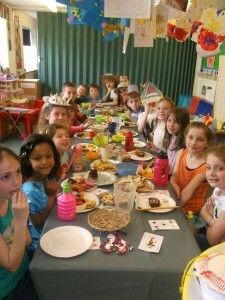 Pictured is the Mad Hatters Tea Party where children dressed up in wacky clothing, enjoyed party food and iced tea and made their own jam tarts and Easter cakes. Pictured are: Alice Grimsham, 10, Ella-Mae Tierney, 5, Grace Ballard, 4, Maisie Carpenter, 6, Mia Rochelle Crombie, 8, Cameron Moran, 8, Dawid Renc, 6, Charlie Carpenter, 8, Geaorge Rowand, 8, Kaysan Shazad, 5, James Rowan, 8, Harry Rowand, 8, Fiona Rodgers, 9, Freya Hill, 8, Kyra-Leigh Rice, 8 and Ellie Grimshaw, 9.